My parents bought a Mac 128K in 1984 (pictured below). The screen stopped working in 1993, and it hadn’t been reliable at that point for a number of years–my dad upgraded to a pair of Mac Pluses when they came out and then later he upgraded again to the Mac II. There were lots of frustrating things about the Mac 128. Almost no software worked on it, since it was outdated almost immediately with the Mac 512. MacWrite didn’t have a spell check or much of anything else. Only one program could run at a time–no Multi-Finder. A 1mb Mac Plus was a significantly better computer, especially if you had an external hard disk that conveniently fit under the Mac–thus increasing speed, storage capacity, and the height of the monitor. Even the headphone port on the 128 was mono, if I recall correctly. Yet there was something deeply magical about computing in that era. I spent hours goofing off in MacDraw and MS Basic. At one point, my dad had the system “maxed out” with an Apple 300 baud modem, an external floppy drive, and the ImageWriter I printer. At some point, the modem went away and we were modemless for a number of years, but one day he brought home an extra 1200 baud modem he had at his office and I spent hours sorting out the Hayes AT command set to get it to work–a lot of registers had to be set on that modem; it wasn’t just a simple matter of ATDT555-1212. That reminds me, I need to call Comcast. It seems that they cut their pricing on 100 Mbit connections. I am very excited about the new Mac Pro. We don’t know the price yet. We don’t have full specifications. It’s not clear this form factor will ever support dual CPU packages or 8 DIMM slots (it seems it might only have 4 sockets). The total price for four 32 GB DIMMs currently runs about $10,000 from B&H. Happily, four 16 GB DIMMs is a lot less—around $1,200. 64 GB of RAM is sufficient for me for now, but I am looking to see a 128 GB option for around $1,200 within two years of owning the machine based on how my need for memory has grown in the past. Apple does claim an I/O throughput on flash to be around 1250 MB/s, which is better than my RAID 1+0 four disk SATA SSD RAID in my Mac Pro and faster than my first-generation PCIe Accelsior OWC card. Apple mentions up to 2×6 GB of dedicated video RAM, which significantly beats the 1-3 GB cards we’ve had on the market until now. I also am excited at the prospect of 30″ displays at 3840 x 2160. My three Apple 30″ displays are starting to show their age in terms of the backlight wear—it takes longer and longer for them to come to full brightness. I bought a Dell 30″ for my other desk, and I had to buy a calibrator to get acceptable color out of it. So I am hopeful Apple will ship a matte 30″ 4K display… (this seems rather unlikely). Only four USB ports is a shame, but not the end of the world. Hopefully the USB 3 hub issues with Macs will be resolved soon. And then there are the PCI slots. My Mac Pro currently has a 7950 video card in one slot, an Areca 1680x, an eSATA card that I quit using, and the PCIe Accelsior. Frankly, the new Mac Pro meets my PCI expansion needs—external chasses are cheap if I ever really need slots (just $980 for a 3 slot Magma; and Apple mentions expansion chasses are supported). What makes this possible is that Thunderbolt RAIDs are just as fast as Areca SAS configurations and generally require a lot less monkeying around. I have two Promise 18 TB Thunderbolt RAIDs connected to a Mac Mini in my basement for Time Machine backups and they have been fantastic. Thunderbolt port 4 — 12-24 TB Thunderbolt RAID for home directory. I’d love to see a 12×2.5″ SSD RAID 1+0 when 1 TB SSDs get under the $400 price point. Hopefully the audio out line has an optical connection like the AirPort Express and other optical products. I think this will fit my needs pretty well, as long as a 128 GB RAM upgrade is cheap enough down the line. 256 GB would have been a lot nicer. And best of all, this configuration will free up at least 4 sq ft of floor space where my Mac Pro and SAS chassis sit. If the computer is quiet enough to sit on the desk, then both the Mac Pro and the Thunderbolt RAID only take up about 1.5 sq ft of room, which would be a tremendous improvement in my office where space is a premium. This week I finally got around to biting the bullet and buying a 250 GB SSD for my Mac Pro. 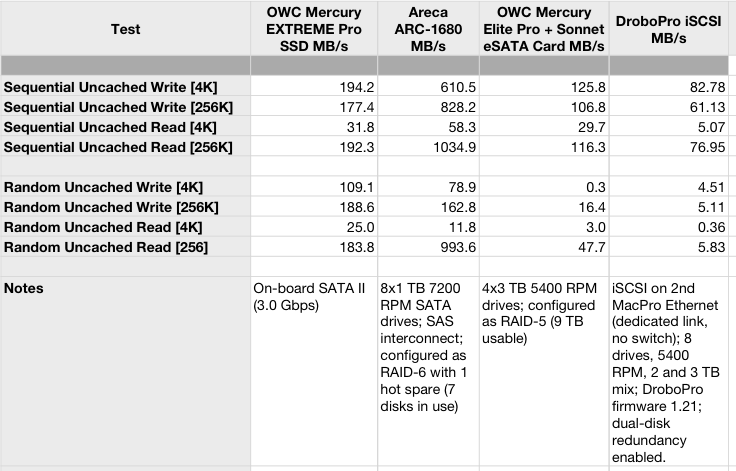 I’ve been using MacBook Airs with SSDs for a few years now, but since I had a fast SAS RAID array on my Mac Pro, I had been pretty content to live without one in the Mac Pro. My Mac Pro is almost 4 years old and really starting to show its age. I’ve been hoping to keep it limping along until the next revision. 1. DropBox seems to have hard-coded /Users/<name>/Dropbox for its path. But my home directory is now /Volumes/sas-raid/Users/mitch. I wonder what else has the home directory hard-coded. So the SSD performs slower than the RAID for everything sequential, which is not surprising. (If you’re wondering why these results are lower than some SSD numbers you might have seen, bear in mind the 2008 Mac Pro has a slower SATA interface than the modern stuff.) However, the SSD is faster–in fact, twice as fast for small random reads! This is rather remarkable–the SSD runs about $400 and the RAID setup is about $2,000 (though with 32x the physical capacity). The “real world” results in terms of how the computer feels is fantastic. All the usual speed you’ve heard about SSDs was true for me too–faster OS boot, faster login, faster app launches. I have a Windows 7 Pro VM for Outlook and a Linux development VM, both of which I tucked onto the SSD and resume/suspend is very fast–and best of all, VM operations don’t interfere with other operations on the computer. I will probably add a second SSD for these two VMs shortly. Most striking here is the 300x difference between the small random writes on the eSATA RAID and the SSD! I believe this RAID is waiting for data to be on disk (vs the disk cache) and perhaps the other RAID examples are not (Areca is pretty clear on requiring a UPS for data integrity). And of course, we see an 8x favor for the SSD for small random reads. For the cost, I really like the performance of this RAID unit and plan to buy another of these with 7200 RPM drives. The Sonnet eSATA card I am using is SATA I and II; upgrading to the Sonnet Tempo 6Gb card probably won’t open up the performance of this RAID further (which OWC says is 3.0Gbps = SATA II). What should you conclude? Certainly what makes sense for your work is likely different than mine. But you’re still going to have an OS and applications and the SSD random I/O performance makes that quick. What else you augment the SSD with may vary, but I think at this point, any and every power user is going to see benefit from investing in one or more SSDs. All the benchmarks were performed with XBench 2.1. I ran them a few times and eyeballed that the results were relatively consistent. I didn’t do any averaging. The computer was otherwise relatively idle, with regards to both CPU and I/O. An obvious benchmark that is missing here is comparing the speed of a single SATA internal disk. I just don’t have any bare drives in my Mac Pro to test at this time. 2011 is just a week away now and there’s a few things I’d like to see come to the Mac in the next year. 1. Google Apps Sync Engine for Outlook. Without this, Outlook on the Mac isn’t as exciting for Google Apps as it is for Windows. 2. Xobni for Mac Outlook. Xobni is a very handy tool and I have bought copies for it for both machines on which I use Windows. But I’d really like to have it on the Mac. 3. A Salesforce.com plug-in for the Mac Outlook. Again, we feature parity with Windows would be nice. Specifically, I want to easily tie emails onto contacts and opportunities in Salesforce.com. 4. OmniFocus needs a little email improvement. Right now, using email to send something to OmniFocus requires Apple Mail and custom rules. I’d like to see one of two solutions: (1) is to have OmniFocus check email with a dedicated account that the user configures. This seems confusing to explain to customers, so I am not sure that’s a good solution for Omni. (2) is for Omni to provide an email service, just like Evernote does. Evernote gets email integration right–just like Salesforce does–everyone should copy their approach. 5. More native DropBox support for iPad and iPhone apps. OK, this isn’t exactly Mac-specific, but I’d really like to see OmniFocus and Evernote applications able to browse DropBox contents easily. Native DropBox support for DAV as a front-end and DAV in apps with an eye towards simple DropBox integration would be handy. 6. Some better graphics tools. I use Photoshop, Illustrator, OmniGraffle; I’ve played with Pixelmator, DrawIt, and others–but somehow none of these quite do what I want for “marketing graphics”. I want the control of Illustrator and Photoshop to build widgets and something like OmniGraffle but with more intelligence to piece them together. This almost sounds like ClarisDraw… but EasyDraw isn’t the answer either. 7. More head-less and powerful virtualization. VMware Fusion guest processes are lost when the Mac window server goes away (e.g., killed via remote ssh). VMware Fusion needs support for multiple Ethernet interfaces without hacking around in random files. I’d like to see something marketed for a more professional workstation user with more of the Workstation features. I’d be happy to see a Fusion Pro or something at a higher price point if that is what’s needed. 8. VMware VI Client without having to run a Windows virtual machine in Fusion or investigate awkward WINE stuff. I have some other wishes as well–I’d like to see Apple fix the broken iTunes sync with devices and limits around a single library. For example, music I buy on the road I cannot sync to an iPod or iPad or iPhone, since they all sync to my desktop–and my 256 GB MacBook Air isn’t big enough to hold my 1 TB iTunes library. TotalFinder ($15) — This is a plug-in for the Mac Finder that adds tabbed browsing and some other nifty hacks, such as a “two-up” tab view for looking at two directories concurrently in the same window. Finder window management has been a mess for 26 years, and perhaps a real problem for me for the last 20 years, so it’s nice to see someone working on this. SecondBar (free) — This puts a second menubar up on a second monitor. Unfortunately, the name reflects reality–it only provides 1 more menubar, and not one per additional screen. However, it works well for what it does. I tried some other menu utilities, but they all miss the boat for my needs. BetterTouchTool (free) — This does a number of things with the Magic Mouse that didn’t seem very useful to me. However, it also provides Windows 7-style window snapping, which is one of my favorite Windows 7 features. And it works better with multiple monitors than the Windows 7 feature does. StoryMill ($50) — The killer feature for StoryMill is the full-screen mode. It’s significantly better than what Word or Pages have for full-screen and makes writing prose much easier for me. Of course, it brings a lot of organizational tools for writing very long documents (books!) as well. I love using StoryMill for cranking out raw text to be edited later. Kaleidoscope ($40) — This is a very cool differ. There are certain things that I miss from my own differ, RoaringDiff, but my favorite part about Kaleidoscope is that I don’t have to fix the bugs. I just started looking at Kaleidoscope today, but expect I will be registering soon once I’ve confirmed that the CLI entry point will work well for my svn workflow. Evernote (free or $45/yr for premium) — I’ve been using Evernote for a while now. Recently I added two new pieces to my Evernote ecosystem. One is that I’ve configured the email address book on my multi-function printer/copier/scanner like this one (the one I have is no longer available) so that I can scan paper into Evernote with 4 button clicks. The other is that I bought FastEver Snap ($2) for my iPhone, which lets me photograph whiteboards and upload them to Evernote immediately without having to take explicit action. I do a lot of heavy disk I/O on my desktop Mac in testing code related to storage. For years I’ve wanted to have some fast primary storage on my Mac to speed up my work. In the past, I had used internal SATA drives and software RAID for drive failure protection, but speed isn’t really there. In hindsight, I probably should have ordered my Mac Pro with the built-in RAID card. The card runs around $800, but installing it apparently requires some cable work that I didn’t want to get bogged down in. After reading some of the forums, I wasn’t sure that was such a great choice for me either. I considered SSD for boot and some kind of cheap external RAID for data, but most of the cheap external FW RAIDs are crap (I tried a few of them). What I ended up with has been fantastic. I have a 8×1 TB physical array with 7200 RPM SATA drives that run around $90/ea on Amazon. These are in a single 8-drive chassis from www.pc-pitstop.com. I had never ordered from these guys before, but the order showed up fast and in good shape. I bought two SAS cables and an internal SAS card–the Areca 1680x. Altogether, this ran me about $2,300 for the drives, chassis, and the SAS card and cables. With the EFI firmware loaded into the Areca 1680x (found on their FTP site), the SAS card is bootable in my 2008 Mac Pro and I have no internal hard disks. The RAID is configured as a 7 disk RAID-6 with 1 spare drive. Creating the single RAID volume (~5 TB usable) took a while, and I/O performance is very fast. Management for the Areca card can be handled with a local driver and web browser, or through Ethernet and a web browser, which is what I’m doing. The card provides a separate Ethernet port for management, so there’s no weird software bridging. This is awesome stuff–the PCIe card is essentially managed as an appliance via HTTP from any host. One thing to keep in mind if you are new to RAID–RAID is not a substitute for backups. A hardware RAID is formatted by the controller card and only that card will be able to read the data. For backing up, I use Time Machine with a Drobo Pro loaded with 12 TB of drives, connected via iSCSI on a dedicated NIC. This works very well; in fact, I installed my data onto this RAID by doing a recover from Time Machine. If you’re looking for high-performance direct-attached storage for a Mac Pro, it’s tough to top this solution–It’s bootable, it’s relatively cheap, and it’s fast. I’ve been running this for a few months now, and it’s been completely reliable. My only complaint is with the chassis–there is a power button on the front at the bottom, which is an accident waiting to happen. However, this is minor and the price is right. My name is Mitch. I make software. I have a cool new software company in Boston, Bit Lasso, where I am building a number of products, including this one--a slide deck search and compare tool: I'm working on a number of other exciting products, too, and I can't wait to tell you about them. I start companies, write software, collect designer lamps, make saw dust, grill and smoke meat, watch Clint Eastwood movies, and enjoy remodeling projects a little bit too much. You can email me at mitch.haile@gmail.com. This blog mostly contains information I wished I could have found out on Google but had to go learn first hand. I've met a lot of cool people via Twitter, LinkedIn, etc. over the last four or five years. Feel free to drop me a line by posting here or emailing me at mitch.haile@gmail.com. What’s the deal with printers? Copyright © 2019 Mitch Haile. All Rights Reserved. Wordpress theme based on "Big City".